My friend Marta writes from Santa Cruz. "Help, I’m drowning." She’s joking but unfortunately she’s not too far from the truth. 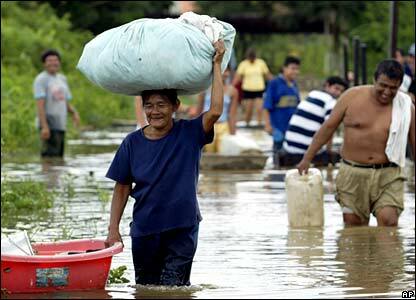 A vast amount of Bolivia, equivalent to the size of the UK, is currently under water after incessant rains for weeks. Strangely the city of La Paz and Tarija where I have been are largely untouched, but the images on the television every night are all too graphic of families fleeing houses, cattle swimming desperately looking for dry land, villages almost completely surrounded by vast lakes. The full-scale of the crisis here is going to take time to emerge because so many communities have now been cut off, but it has devastated peoples’ homes, crops, livestock as well as a lot of the infrastructure of the country. The estimates are that 350,000 people have been affected. As ever it will be the poorest who suffer most. The bad weather is being blamed on the cycle of weather patterns called El Niño caused by warm waters in the Pacific, but most commentators say that global warming is making it worse. President Evo Morales made the powerful point yesterday in a speech saying that "there are countries who in their uncontrolled and unmeasured policies of industrialisation are affecting the planet, contaminating the earth and destroying the environment and it is the poor countries who pay the cost." He pointed out that Bolivia was having to face the consequences of rich countries’ irresponsibility with little economic resources and limited external help. By contrast he said that indigenous peoples in Bolivia and South America live in harmony with Mother Earth, Pachamama. He called on the rich North to live up to its responsibilities outlined in the Kyoto agreement to cut emissions. It is a numbing thought that our unsustainable lives in the North in someway directly affect communities in the country I now live. As we fly for a city weekend break in Barcelona, a woman in a village Santa Cruz flees her home clinging to a few possessions. Our lives are connected more than ever, but are we prepared to think about what that really means for our lifestyles?